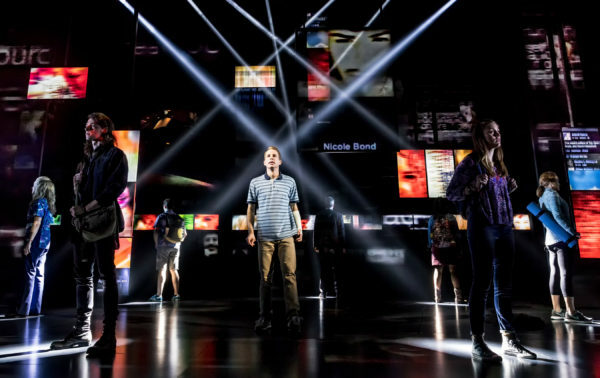 Dear Evan Hansen is the new Broadway musical that speaks for the teens and adults who outwardly reassure everyone that things are “fine” while inwardly wishing “everything was different.” Through snot, tears, racking body and quivering lips, Ben Platt (Pitch Perfect) is vulnerability incarnate as the title character. A teen with no friends, he hates being invisible and yet is desperate to keep the darkest parts of himself just so. Evan finds himself caught up in a misunderstanding and suddenly he is noticed. Platt walks away with this moving show about the secrets we keep and the evergreen hope for being truly seen and loved. It’s a performance in which he matches the audience tear-for-tear. All tics, nerves, social anxiety, and awkwardness, Platt’s Evan is fumbling through an unremarkable life unnoticed. His therapist has assigned him to write self-confidence boosting letters to himself: “Dear Evan Hansen. Today is going to be an amazing day, and here’s why.” But he struggles to eke out one. There is only so much he can fake. His single mother, Heidi (Rachel Bay Jones), works double shifts and takes classes at night school. She tries her best but Evan gets lost in the shuffle. A run-in with the moody, troubled Connor Murphy (Mike Faist) on the first day of senior year puts into motion an unexpected series of events for Evan. Connor commits suicide and his parents (Jennifer Laura Thompson and Michael Park) finding a “Dear Evan Hansen” note on Connor makes them believe Evan and Connor were close friends. From this confusion, a spotlight is thrown on Evan—and with just a few lies he gains notice, affection, popularity, and the doting concern of the Murphy family. Now Connor’s sister, Zoe (Laura Dreyfuss), who Evan has ardently pined over for years, wants to spend time with him. Evan then sets out to create the Connor Project so that Connor’s memory does not fade away. His classmate, extra-curriculars addict Alana (Kristolyn Lloyd) jumps on-board and turns it into a major online fundraiser. But as the project grows in prominence so does the danger of the truth coming out. Musically the compositions by Benj Pasek and Justin Paul are robust traditional musical theater tracks with a few reaching for a singer-songwriter/pop vibe. But it’s the lyrics by Pasek and Paul that turn those catchy tunes into something more potent. Suffuse with narrative purpose and emotional impact, the lyrics of the songs crack open each character allowing us to know their real fears and worries. Pasek and Paul avoid clichés and the yoga mom, single parent, forgotten daughter, and lonely boy are more than their labels as they sing about the complexities of parenting, divorce, grief, and friendship. Since Dogfight, Pasek and Paul have shown themselves to be the team who can wrestle with sophisticated material and deliver poignant drama. The show is aided by Platt’s unguarded performance. Platt is equally riveting whether singing Evan’s pent-up agony or walking in his anxiety-prone shoes. In a tender scene with Zoe (Dreyfuss matching Platt’s gentle, sweetness with a self-effacing subtlety), Evan starts to pre-suppose why she wants to talk to him, racing through all the fatalist thoughts he has. When she reassures him she’s not trying to break-up with him, he thanks her as politely as one might thank a waiter bringing the check. In that moment, Platt reaches out and just brushes Dreyfuss’s arm with gratitude. It’s a tiny gesture but emblematic of Evan’s awkward nature in social interactions and tinged with a wisp of desperation for a real connection. The book of the musical, by Steven Levenson, nicely balances some of the darker themes against a comedic lightness. Despite the subject matter, Evan is not all doom and gloom. There’s great joy to be had in these quippy teens. Evan’s nervousness makes him funny and charming, even if he wishes to subdue these tendencies. But the story gets a little tripped up by the social media space it depicts. Because so much of the musical moves with careful elegance, some bald plot machinations stand out in contrast. The musical depends greatly on social media to build the dramaturgy of the story—teenagers on chat and Twitter, stories going viral on Facebook, and the addictive draw of getting validation and meaning through clicks. The musical tries to address both the positives and negatives of this interconnected world, but they get played out in clichéd extremes—the internet is either a sugar-coated Upworthy community or everyone is the literal worst. In addition, certain plot points fall to Alana, a character we barely know and whose motivations are confusing. She is more plot device than person which breaks some of the show’s delicate magic. But these are small complaints on the whole. Dear Evan Hansen lets us get close to a wounded boy and makes it possible for us to recognize those same pains in all of us.